The Pyrenees mountain range on the border between France and Spain are well known among all cycling fanatics. It's a fantastic cycling trip from Biarritz (on the Atlantic coast) all the way up to the Mediterranean Sea. This challenging trip leads you over all the famous cols of the Tour de France. Private groups only from 6 persons or more. The Pyrenees mountain range on the border between France and Spain are well known among all cycling fanatics. It’s a fantastic cycling trip from Biarritz (on the Atlantic coast) all the way up to the Mediterranean Sea. 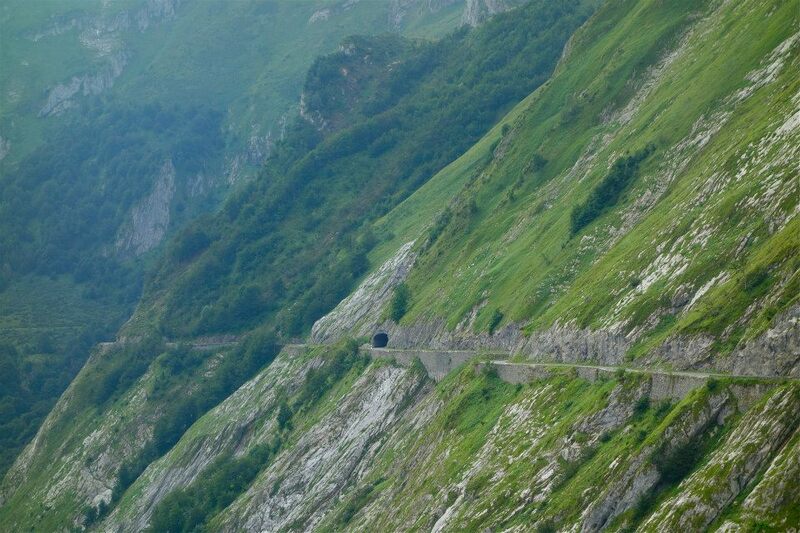 This challenging trip leads you over all the famous cols of the Tour de France. This Trans Pyrenees road bike trip includes many highlights including an extra transfer to Bedoin (Provence) to tackle your last epic climb to the Mont- Ventoux! The adventure starts in the quiet little sea village of Saint-Jean-de-Luz just South of Biarritz. Get some rest to get ready for a great, unforgettable ride across one of the most beautiful parts of France. From the foothills of the Pyrenees in Saint-Jean de Luz you start with a warm up before tackling some of the most (in) famous and legendary Pyrenees climbs. Just a pick of which mountain passes you’ll conquer! 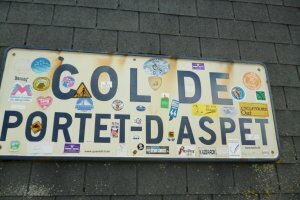 Col du Tourmalet, Col d’Aspin, Col de Peyresourde, Col d’Aubisque, Col du Marie Blanque, Col du Portret d’Aspet, Hautacam and last but not least Col du Mont-Ventoux. You’ll cycle over quite country side roads through typical French villages. The rides are spectacular with breath-taking passes and majestic mountain scenery. 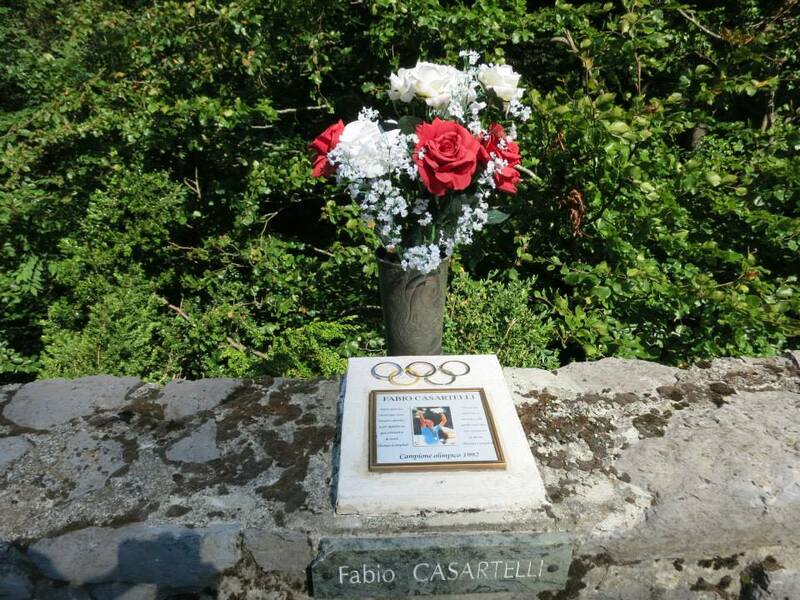 This tour has been specially designed with you, the passionate road cyclist. 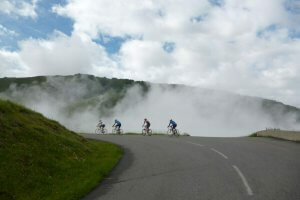 The Trans Pyrenees tour is open for cyclists with a high fitness level. 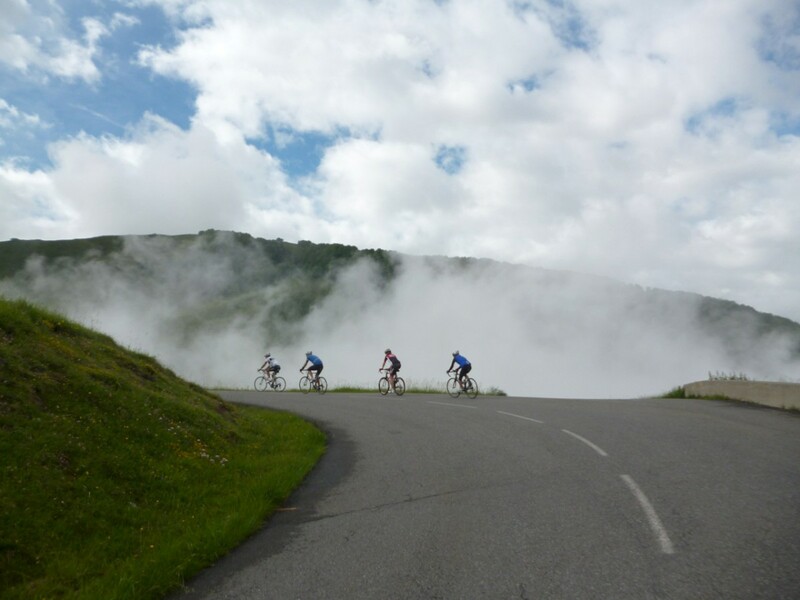 Jump on your bicycle and cycle all those famous Pyrenees cols of the Tour de France! The “Queen Stage on day 6. Pick up at at Biarritz Airport and transfer to your hotel in the quiet little Basque village of Sare next to Saint-Jean-de-Luz just South of Biarritz. Get some rest to get ready for your great, unforgettable ride across one of the most beautiful parts of France “the mighty Pyrenees”. Welcome drinks at the main square Sare near Saint-Jean-de-Luz followed by dinner in an excellent local restaurant. Dinner is included. After breakfast you start with your first cycling day! Too leave the pleasant sea village of Sare behind us. Soon you will ride into Spanish territory (region of Navarra) over Col de St Ignace, a fairly easy climb just 3.5 km long. These climb is perfect as a warm-up ride. Our second climb to Spain's Puerto de Otxondo will be a bit tougher 602m and 9.5 long. After the Oxtondo we head back into France over the most beautiful climb called: Col d'Ispeguy (672 m). The views are incredible on the descent into St Etienne de Baigorry. 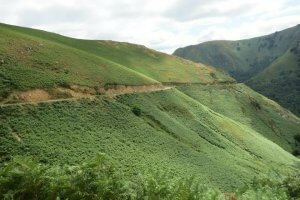 Your final destination will be the ancient Pyrenean village of Saint-Jean-Pied-de-Port. The first climbs to Col des Gamia and Col d'Osquich, will give you the taste of the real beauty of the Pyrenees. You will face Col du Marie Blanque. 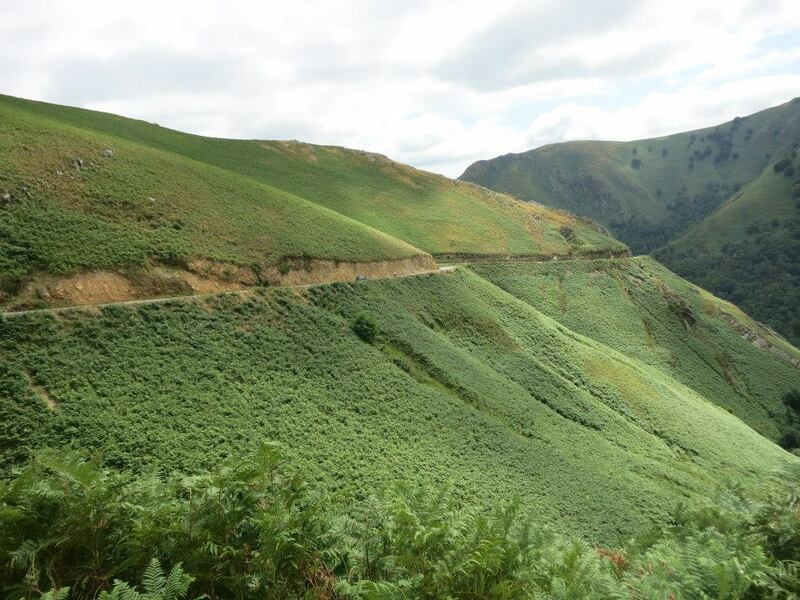 The ascent of the Marie Blanque isn’t an easy one, especially the last 4 km will be hard. From here you continue to your hotel located on the way up to Col d'Obisque. 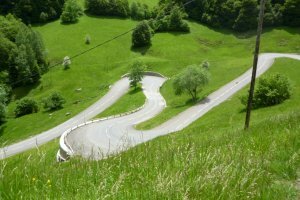 Col d'Aubisque is a legendary Tour peak added in 1910. 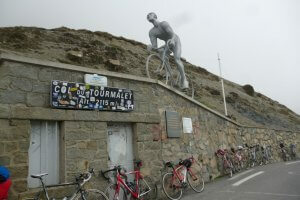 The Tour de France hosted the Aubisque more than 60 times .The mountain summit has been conquered by great climbers. Col d’ Aubisque culminates at 1.709 meters (5.605 feet), progresses for 16.5 kilometers with an average grade of 7.1 per cent rising 1.190 meters. You will start the ride from our Hotel in Eaux-Bonnes, about 8 km from the ski resort of Gourette. Once reached the top, the 20 km descent towards the village Argeles-Gazost is incredibly beautiful, especially the first part to the Col du Soulor where the road runs along cliffs in the Cirque du Litor and there are two short, narrow tunnels. You will stay an extra night in the quiet Pyrenean village of Argeles-Gazost . That gives you the chance to get organized and have some extra time to wash your jerseys and bibs. Today you will climb to the top of the French ski station: Hautacam. You step on your bike In front of your hotel. You ride towards Argelès Gazost and here starts the real climb. The Hautacam ascent is 17 km long; over this distance, we will climb 1.170 meters and the top is at 1.520 meter. In the afternoon you will visit the pilgrim’s town of Lourdes. Today you will face our "Queen Stage". After 12 km you’ll reach Luz-Saint-Sauveur. Left you climb the Tourmalet and the road to the right takes you to the ski station of Luz Ardiden. 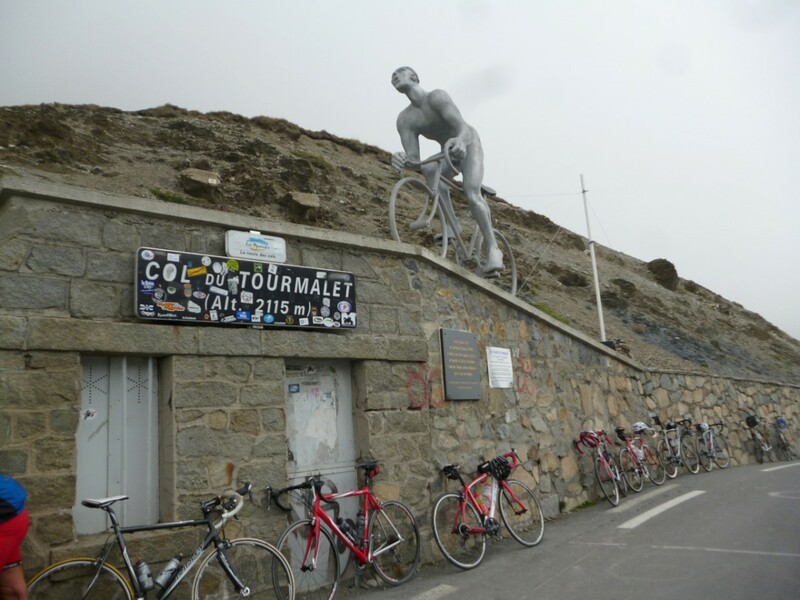 You turn left and up towards the legendary Col du Tourmalet: first included in the TDF in 1910 and was nicknamed "Circle of death”. This Pyrenees super climb is where the legendary rider Octave Lapize called race officials "assassins" as he negotiated the mountain in its Tour debut. 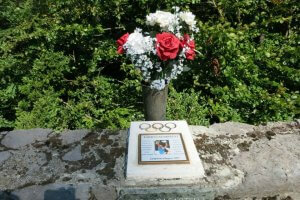 At the peak of the Tourmalet, a monument honours race founder Henri Desgrange. You will then continue and climb to the Payolle plateau and finally the spectacular Hourquette d'Ancizan! This climb is truly beautiful even though not very well known. We will finally ride to our comfortable Hotel in Saint-Lary-Soulan through a very quiet country road. The gentle climb up the Col d'Aspin is 13km long (7km to reach the Payolle plateau). Today is a rest day in Saint-Lary-Soulan. Today is an easy stage. The ride just includes the Col de Peyresourde. Bagneres-de-Luchon is a pretty good size village with many shops and you will have the chance to wash your cycling clothes with few Euros in one of the many "laveries automatique". 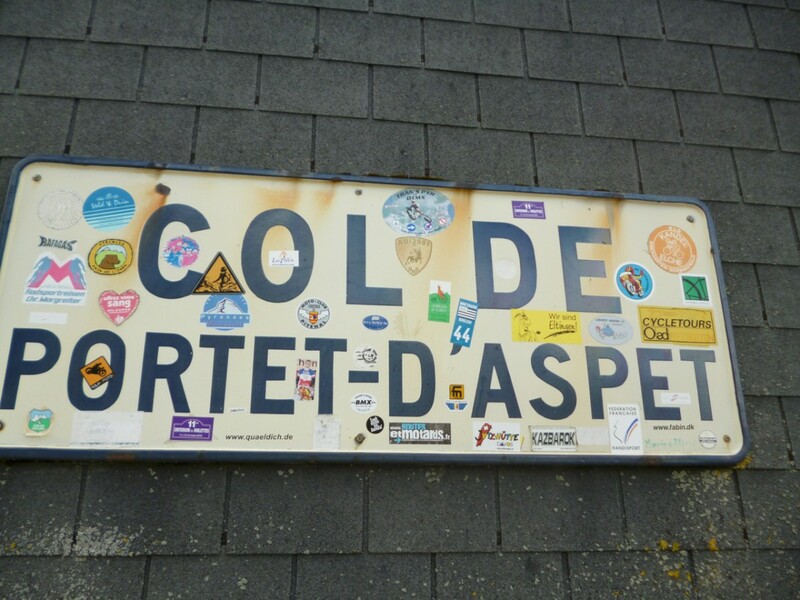 Today's ride will include two really beautiful but rather difficult climbs right in succession: the Col de Menté and the Col de Portet d'Aspet. Especially the second Col will engage you particularly with a couple of steep sections. The climbs of today are less famous but still challenging starting with Col de la Crouzette up to Sommet de Portel, Col de Py and Col del Teil Overnight at a beautiful medieval castle turned into a Resort/Hotel. Dinner (in the castle) is included Total distance 142km – climbing 1850m Climbs: Col de la Crouzette, Sommet de Portel, Col de Py, Col del Teil and Col du Portel. The top climbs of today: the Col du Portel, Col de Coudons, Col des Sept Freres, Col de Chioula, Port de Pailheres and over the Col de Jau to the thermal town of Molitg-les-Bains. Via the village of Vinca, over the Col Palomere and the Col Xatard finishing in Amelie-les-Bains. Morning transfer to Bedoin which will take about 4hours. Afternoon free or optional light ride. Cycle the Mont-Ventoux and expect a hard day in the saddle; if you like climbing, this will be your day where you will face the huge beast "The Mont-Ventoux". 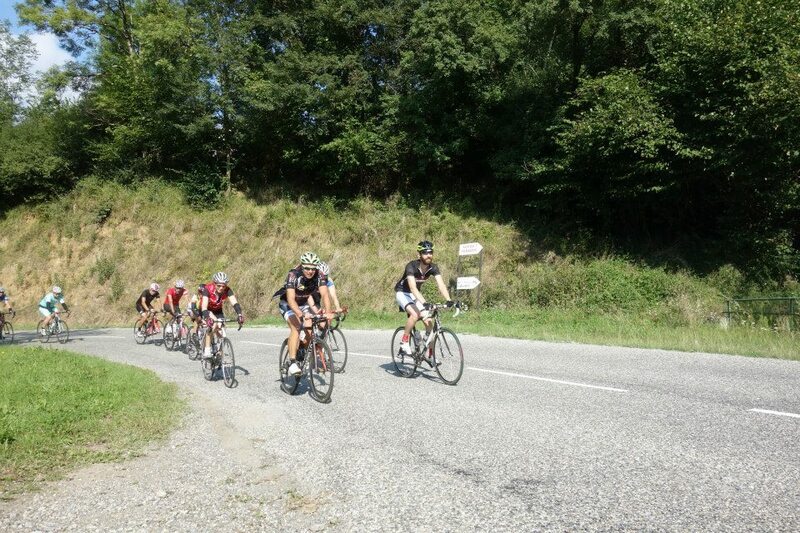 Today’s ride starts again in Bédoin in front of your hotel. Here begins the challenge! The most famous ascent to the Mont-Ventoux. After breakfast we ‘ll climb this big challenger with its top at 1912 meters (6273 feet). You will follow the cycle path of all the greatest riders in the Tour de France.....come on you can do it! After the 22 km climb you'll reach the summit of “Mont-Ventoux”. 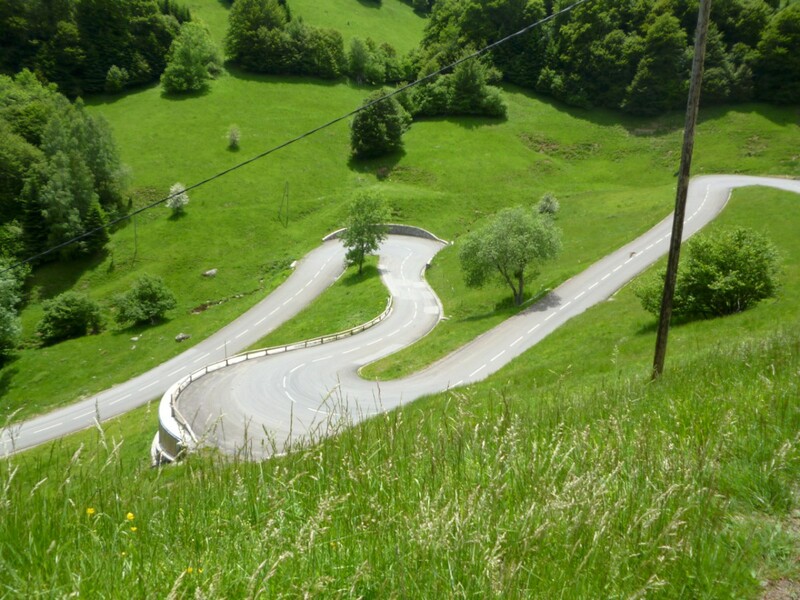 Relax on top and prepare yourself for a very spectacular descent to the villages of Malaucène. From here its only 12 km back to Bédoin. Departure day…..Time to say goodbye, a good flight back home or a pleasant stay in France. Transfers will be made by the tour guide to Marseille airport. Biarritz Airport in the southwest of France is called in full Biarritz "Anglet Bayonne "The airport is the gateway to the western Pyrenees and the Basque Countries in Spain. The airport is mainly serviced by budget companies, but Air France also carries out scheduled flights from Paris Orly, Charles de Gaulle and many other destinations in France like Marseille or Nice. There are regular fares between Paris and Biarritz/Marseille Railway stations. The Airport train stations are located below Charles de Gaulle and Orly International Airport. Almost every hour trains leave to/from Biarritz/Marseille. Paris’s main Railway station is Gare du Nord. From here all trains connect you to almost every destination in France. From Lyon’s main Railway station it’s only a one and a half hour ride to Marseille. Trains also depart from main Railway station Lyon Part Dieu and from airport train station Saint Exupéry to Marseille. All prices are per person based on double rooms. When the tour operator confirms to us. We confirm to you and charge you’re a deposit fee of € 1000 per person plus a € 15 booking fee. Support van during whole Tour.